English professors Elizabeth and Richard are celebrating their 20th anniversary by visiting Jane Austen’s old stomping grounds. From Bath to Hampshire to Steventon and more, this couple has planned the dream vacation. 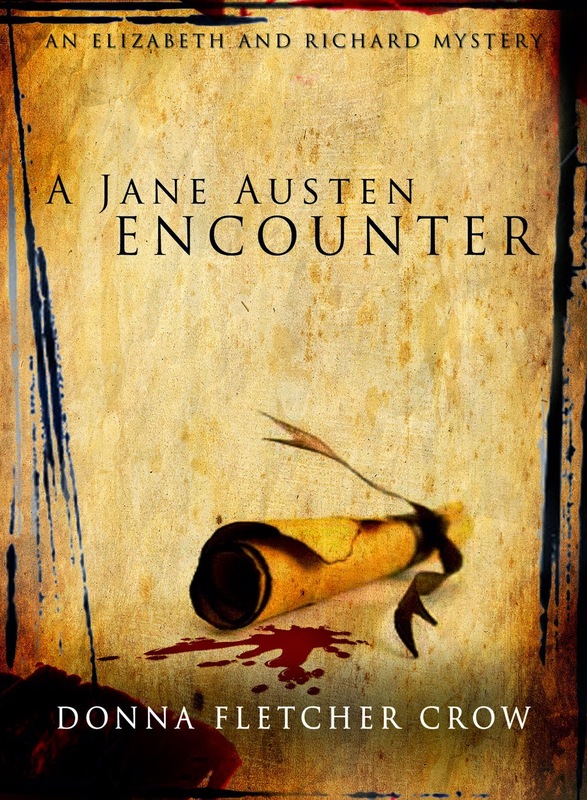 But, when some old papers are donated to the Jane Austen Centre in Bath, Richard ends up helping go through them and begins what will become a multiple-victim mystery, complete with a search for a missing Austen manuscript. Before I even began reading this book, I wrote this in my notes: "I haven't even opened the book yet and I'm excited! I just took a Jane Austen-themed tour this past September to all the places mentioned in the back cover description. I am so looking forward to reading this!" I absolutely adored this book---totally was not disappointed! The author has obviously spent time in the places she's describing. The Jane Austen Centre tea room---oh, I can just see it! She mentioned so many things I just loved about England. The performers in the courtyard and Holy Communion at Bath Abbey, the beautiful assembly rooms, Chawton Cottage---I followed her every step of the way! One line in the book said, "Jane never wrote about a place she did not know personally." This story completely came alive for me because I do know these places personally! The writing style is simple and sweet. My favorite line from Elizabeth: "Logic can be such an inconvenient thing." Love it! I'm definitely looking forward to reading the other two in this series, as well as looking into the archaeological dig at Steventon---the only place mentioned in the story that I didn't visit. Thanks so much to Donna Fletcher Crow for the complimentary review copy. My daughter is enjoying it now, and then it will go into our personal collection. Thank you, Audra! If your library doesn't have the book please request that they order it--that's one of the best ways you can support an author. Blessings! It makes me so sad that I had no appreciation for Jane Austen when I went to Bath, ugh! Will put this on my "list". I would love to visit some of the places I read about. Such as, `Little House` places. Thank you so much for your wonderful review and for sharing this with your readers, Sarah! I'm so glad you got to do the Jane3 Austen trail, too. Thank you all for your lovely comments. This looks like a really fun read! Thanks for sharing it at Booknificent Thursday last week! Hope to see you again this week.